At the time of writing, Yoast’s WordPress SEO plugin (we’ll call it “Yoast” from now on) has earned 4.7 out of a possible 5 stars in the WordPress.org plugins directory, with over 6 million downloads and well over 2,600 five star votes. So, how do you get this amazing plugin to improve your on-site SEO ? In this article, I’m going to show you my optimised settings for Yoast in the post panda era. 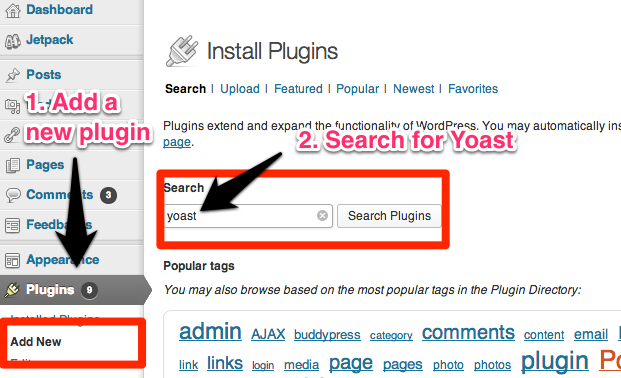 If you haven’t already installed Yoast, go to your WordPress dashboard after logging in, look for Plugins on the left hand side, click on “Add New” (1. in the image above) which will bring up the search form where you’ll add “yoast” (2. in that image) and hit the search button. You can then click on install and “Activate plugin” to get going. This saves knowing how to add code to headers in your website files or having to upload another plugin to do the same thing. No webmaster should be without these Google tools. NB: there’s no need to do this if you’ve already verified your account with Google. There are options in the General section (pictured above) which are intended to make it easier for the search engines to crawl your page. We recommend that you tick everything apart from the meta keywords tag option, because Google stopped using meta keywords as a ranking factor many years ago and having your meta keywords tag displayed will just reveal to your competitors your best keywords. We also recommend noindexing sub pages of archives, as they usually display duplicate content of your posts pages, which is a major issue with the introduction of the Google Panda algorithm. Other goodies available in Title & Meta Descriptions are the ability to tell Google not to index, but still to follow particular page and post types, among other things. Our recommendation is to keep the category part if you have a big site (100’s of pages or more), but remove the category slug if your website is small (100 pages or less). The reason for this is while it is advantageous to have shorter URL’s, for larger sites, this will not work as some pages may have duplicate titles. This is where separating the pages into sub categories with silo structures will help your site rank high in the search engines. 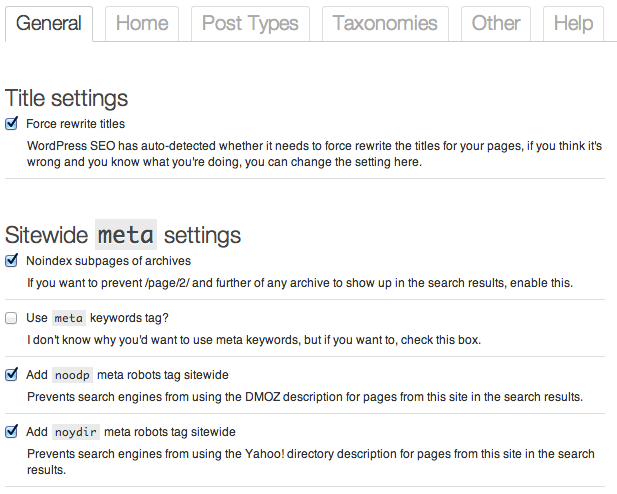 In the Homepage section (above), you’ll see the structure Yoast recommends for your title tag. This tag is extremely important for SEO. The key is to imagine your visitor coming across your title and description in the search engine rankings page. 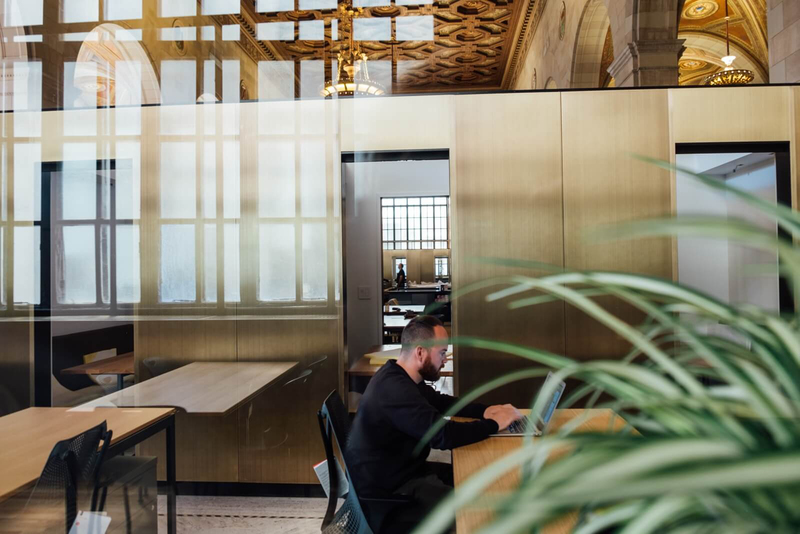 They don’t want to see a title filled with spammy keywords – they’ll want to see that your site will provide them with the information or product that they’re looking for. So, have the keyword that is the focus your web page at the beginning of your title tag and your company name after that, ensuring that the tag as a whole is relevant to your page content. And below is a description tag that you could pair with that. (Remember, the two will be seen together on the search results page). Marco’s Pizzeria is a family-owned restaurant in Melbourne. We’ve been in business serving freshly made pizzas from our wood-fire oven for over 20 years. The title tag should kept between 55 – 67 characters long. If it’s too short or long, Google can rewrite the titles which usually is a bad thing. When your title is too short, end it with a call to action and/or promotion e.g. Buy Now (Free Shipping). 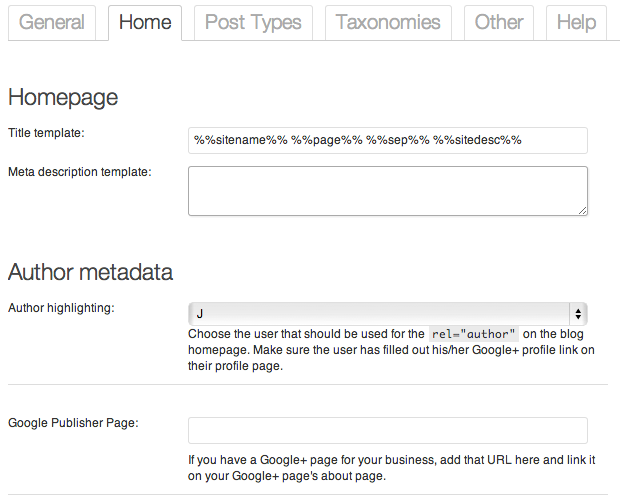 Author metadata will create a connection between your posts and your profile on Google+. This ensures there is no question over the authorship of an article and that’s important because authorship is becoming a big issue for Google. As of this writing, Author Rank is not used as a ranking factor, however, this can change in the future. In either case, we recommend you set it up anyway, as it will display your profile photograph beside your posts on the search results pages, thereby increasing the click through rate of your listing. A lot of your posts titles will be sufficient, and will not require all the other parameters. 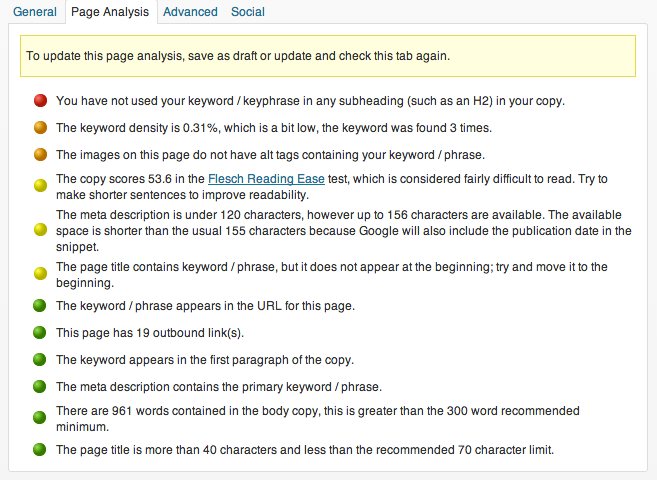 In the Meta description templates on that page, add %%excerpt%% to add the excerpt (truncated text) from your post. Yoast gives you the option to have the plugin create your sitemap, a “must-have” for the search engines as it helps them crawl your site efficiently. It will ping Google, Yahoo! and Ask.com automatically when new content is added to your site. 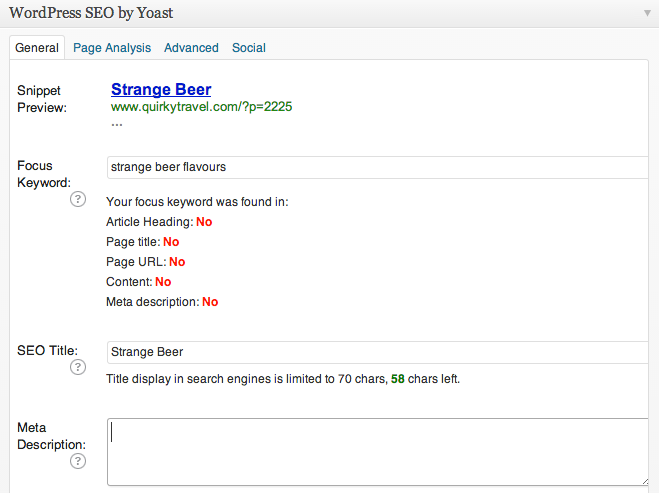 Yoast crucially concentrates your mind on your keyword as you create your post. 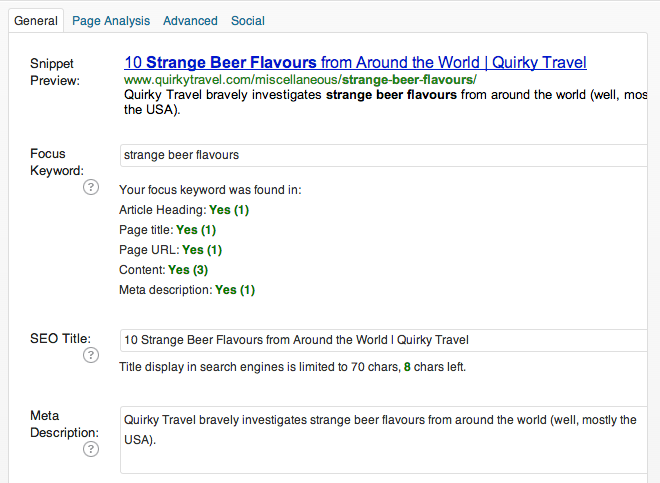 The focus keyword in our example, “strange beer flavours”, was chosen from a list given to me by Yoast – I could have chosen “strange beer flavors” (US spelling) or “weird beer flavours” from a dropdown list provided by them. I wouldn’t use one that doesn’t appear on the list as it’s not likely to be a keyword that people are using. Your aim is to turn the text green where possible. This does not mean stuffing your content with keywords. Over optimising can get you penalised in the post penguin post panda world. However, if you can do wihle keeping the post looking naturally, then try to include your keyword or keyphrase in there once or twice where possible. Our recommendation is always to write for the user and not the search engines. And on the Advanced tab, there are options to nofollow your post, noindex it, redirect or add a rel=canonical tag, amongst others. We recommend that if you have pages that are very similar in content, make sure you deindex all but one version. This usually applies to large e-Commerce sites where a lot of the content for similar items are the same except for the attributes (size, colour etc.). As of the time of this articule (post panda), Google will prefer a site with 50 pages of high quality unique content than to a site with 100 pages with 50% duplicate content. Yoast is a complex plugin with a host of features to enhance your website’s search engine optimisation, and it’s the best WordPress SEO plugin out there at the moment. We highly recommend that if your site is running on a WordPress platform, to give Yoast WordPress SEO Plugin a go. Thanks for sharing the latest post about the latest plug-in of the word-press tools. Yoast is a complex plug-in with a host of features to enhance the website’s search engine optimization, and it’s the best Word-Press SEO plug-in out there at the moment. But I refer the All in one Plug-in that is easy to use and also available for the all versions of the WordPress. Its amazing post, I have got much clear idea regarding from this piece of writing.